CLOSENUF is the brainchild of Anthony J. Foti, a Bklyn, NY Singer/Songwriter, who comes from a family of vocalists including his mom, grandfather & cousins. Privately trained operatically (Vocally) in youth & adolescence & with a Concentration in Musical Studies (Songwriting) at Pace University, where NYC musical sage, Professor Hannah Hall gave him the speech every young aspiring artist longs for, to pursue the realm of a professional career, "He's got what it takes." By 1994, he was actively playing the NYC club circuit with his original compositions, co-founding the record company -- Wreckords Records, Inc. (ASCAP), to release & track his work. He released his 1st album in April 1994 with the acoustic progressive rock duo, “Blackwood & Foti,” whose EP was produced by Dave Greenberg (Van Morrison), & Al Greenwood (Foreigner), with drummer Vinny Conigliaro (Joe Satriani) & guitarist Al Pitrelli (Asia) guest starring. The power ballad on the work was saved to be produced by Steve Jerome (Neil Diamond, The Left Banke) & John Abbott (Dionne Warwick) with guitarist Jeff Munzert (Jim Messina) guest starring. This single, "In the Eyes of the Rose (The Jerome Mix)" was released on 9/14/94 by Bill Jerome Promotions, with 7% of National U.S. Radio Stations airing it on their Top 40 Play List Rotation (MO, WY, KY, GA, SD, TX). On 9/12/01, despite the tragedies of the time, Anthony launched a project with other local singer/songwriters forming CLOSENUF, the next Singer/Songwriter Rock Band to attract a fan base from The Beatles to The Stones, from Dan Fogelberg to Billy Joel; a multigenerational love-fest of melody & good clean stage oriented Rock & Roll. 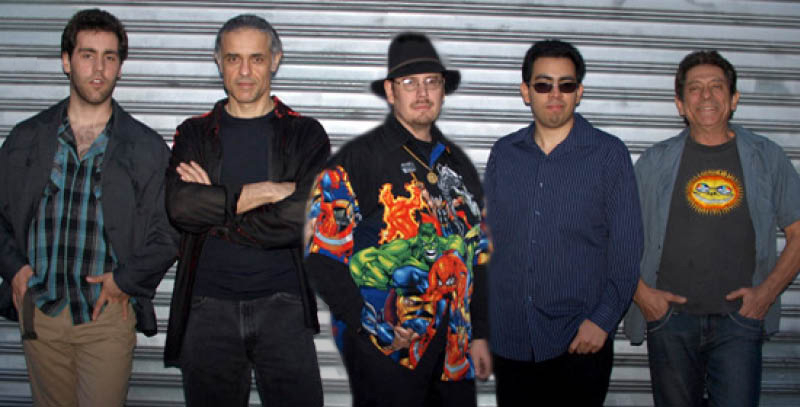 In April 2005, they released their debut LP, guided in the studio by Steve 'Woody' La Cerra (Blue Oyster Cult), with whom the band continues to collaborate. The band through its grass roots efforts became a staple on the NYC music scene, as well as performing live from LI to Philly to Atlantic City, were featured in publications from The Village Voice to 20th Century Guitar Magazine, appeared on The Joey Reynolds Show on WWOR NY Radio, The Dr. Lou’s House of Blues Radio Show on WNJC NJ/PA Radio, & on The Media Factory Show on PATV CT TV, & received four 2005 Garageband Reviewer Awards. In 2006, CLOSENUF’s music video was nominated for The 2006 IMMIE Award (Independent Music Award) for Best Indie Music Video of the Year, & by DigiFestival for an Absolute Winner 2006 Edition Award in Italy. In late 2006 into 2007, Pic Hitz Entertainment released CLOSENUF music to CHR/Pop (Contemporary Hit Radio) & AAA (Adult Album Alternative) Radio Stations for National U.S. Airplay (NM, TX, OH, KY & VA). They performed in The 2007 Original Sessions National Band Search Series Competition in NYC competing for 3 rounds, were chosen to perform in The 2007 Goodstock Festival in WV (promoted by Artie Kornfeld), as well as GoodTimes Magazine’s LI Music Festival & M.E.A.N.Y. Fest 2007 Competitions, signed rights & clearances for usage of their compositions in a 2008 Independent Film Documentary, as well as offered solicitation by Octobertunes for additional TV & Film usage, participated in The 2008 Make Music NY Festival (co-sponsored by Time Out NY Magazine), & performed at The Woodstock Trading Company’s Great Lawn in Cherry Hill, NJ. Also in 2008, CLOSENUF were chosen as Semi-Finalists in The NE Independent Music World Series, making Anthony’s 2nd appearance in this competition at this level! Like most projects of such extended life, some member shifts are inevitable, but on the 15th anniversary of the record label, we celebrate with its latest June 2009 LP release, “CLOSENUF…to a new beginning,” it captures all of Anthony’s writing & lead vocals from the band’s established repertoire, as well as new selections with the fresh sounds of the band’s current line-up (as always, all talented NY Musicians in their own right), as well as alternate mixes of fan favorites with special guest players including saxophonist Robert Randazzo (Marvin Hamlisch) & award winning coloratura soprano Phyllis Falletta. In Aug 2009, Mojo Alt 94.1FM Radio 2 in Macedonia, Europe started spinning tracks regularly from the release. In October 2010, Anthony was given his own 1 Hour Special on Blog Talk Radio on NYC’s Roman Midnight Music Show focusing on his career. Check out the EPK to end all EPKs, .closenuf for info on the latest line-up, photos, news & appearance schedules.